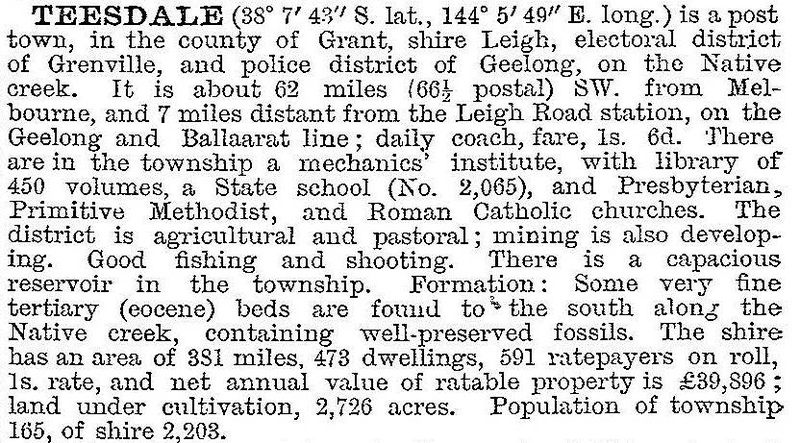 Teesdale is a rural town 27 km north-east of Geelong and 10 km east of Bannockburn. It was apparently the name of an outstation of T & S Learmonth, pastoralists, who occupied the Native Creek run in the mid-1830s. The Presbyterian school was replaced by a government one in 1878. Teesdale had active cricket and football (Sheldale Rovers) teams, and the town recreation reserve has had tennis courts and a pavilion added to it. Part of the reserve contains grassy woodland with manna gum and diverse ground-cover plants. Teesdale has a general store/post office, a public hall (built 1973 after the mechanics’ institute burnt down), a primary school (183 pupils, 2014) and the historic Presbyterian church. Residents produced the Teesdale Community Plan in 2011 with priorities including a town centre and walking and bike tracks to Bannockburn.